NutHost Review 2019: Is NutHost a Good Hosting? 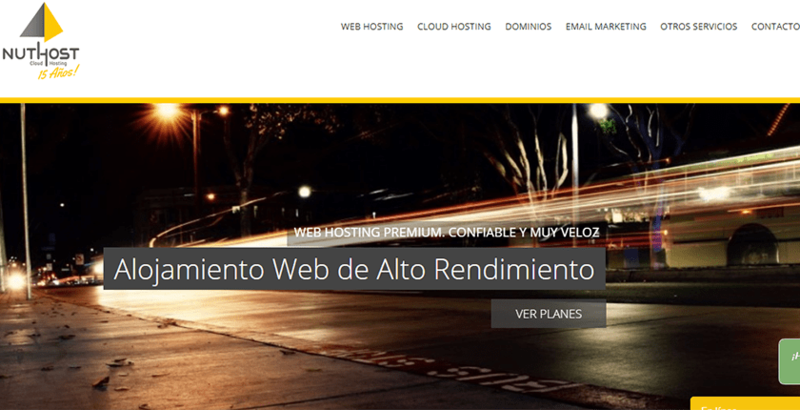 NutHost is the main web hosting service in Argentina and offer solid features for most personal and business websites. However, standard hosting limits you to a single domain, and their support was disappointing. NutHost has been in operation since 2003 and is presently one of the primary web hosting providers in Argentina. Over the years, over 45,000 websites have used their services, and they have made a name for themselves by offering website hosting with features suitable for most websites. However, their standard hosting only allows for a single domain, and I found their support less than impressive. NutHost offers shared hosting services that have excellent storage and bandwidth. The majority of their standard website hosting plans offer the following features as standard. In addition to these features, they offer free SSL certificates on all plans, saving you money over other services who charge up to $50 per website for certificates. Unfortunately, they don’t offer support for Python or other web programming languages. NutHost offers a simple one-click installer for programs such as WordPress making it easy to set up your website. Otherwise, you can use cPanel access to upload your files. They presently don’t offer a drag and drop website builder. All plans offer excellent storage and bandwidth, but the Nuke plan comes with a single database and just ten email accounts. However, the difference in cost between Nuke and NukePlus is minimal, so there’s almost no reason to choose Nuke. I don’t like that their standard hosting plans allow you to only host a single domain. You must buy reseller hosting to get multi-domain support. Also, they don’t offer free domains, so you’ll incur that cost annually if you don’t already own a domain. In addition to the basic hosting plans, NutHost offers Cloud Hosting, WordPress Hosting, Moodle Hosting, and PrestaShop hosting. Each has their own group of available features, but are also much more expensive than the standard hosting. While NutHost offers robust support options, I was left disappointed with their support. They provide international telephone support including to the United States as well as direct lines in Argentina, Chile, and Mexico. They also offer email support and live chat. Their knowledge base is quite extensive and excellent for those that like to research their problems rather than rely on someone else to fix their issues. My experience with their support was that it is lacking. I tried contacting them twice via live chat and failed to receive a response after five minutes both times. I did finally receive an answer to my email after more than 24 hours. If you’re looking to host a single website, then NutHost offers great plans with most offering unlimited bandwidth and massive storage. For those needing to host more domains, either check out their reseller plans or choose another provider that allows multi-domain hosting. Wondering how NutHost stacks up against other Web Hosting companies? Enter any other Web Hosting company and we will give you a side-by-side comparison.